The successful orbital insertion after a 6-minute engine burn marks the end of a six-week series of ever-expanding loops around Earth, a path designed to accommodate Beresheet's piggyback launch with another satellite. From here, the spacecraft will spend another week orbiting the moon before touching down on its surface. If all goes smoothly, April 11 will see it touch down softly near Mare Serenitatis. Once it lands, Beresheet will work for just two or three Earth days, since its science goals are quite limited. A view of the far side of the moon captured by the Beresheet lander during its lunar orbital insertion on April 4, 2019. 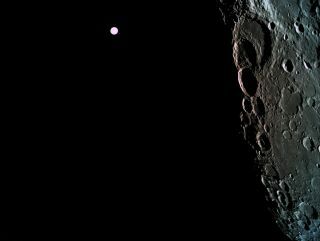 The spacecraft's landing site is on the near side of the moon, but these first two images released by the SpaceIL team star the far side of the moon. However, landing there is a much more complicated endeavor, since it requires a communications relay satellite to ensure the lander can still send data back to Earth. That's the approach being taken by China during its ongoing Chang'e 4 mission, which landed Jan. 2. And the pair of lunar robots may have still more company, as India seeks to launch its own moon lander mission, Chandrayaan-2, later this year.